We considered a number of options to upgrade our backhaul network – including extending our fiber or wireless systems from other manufacturers. But the BridgeWave systems outshined all other options in performance, capabilities, and cost-to-value. 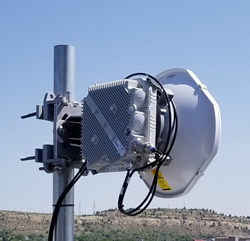 BridgeWave Communications, a market leader in next-generation wireless backhaul systems, today announced that Blackfoot, a leading Internet service provider (ISP) in the northwest United States, has extended its fiber backbone using BridgeWave Flex4G-LITE multi-gigabit radio systems to provide high-capacity Internet connectivity to new and existing business customers. The BridgeWave systems were installed and passing traffic within eight hours, and at a fraction of the estimated $100,000-$200,000 it would have cost Blackfoot to extend its existing fiber. BridgeWave systems provide a fast, easy, and inexpensive way to extend backhaul networks without the cost, time, and complexity of new or leased fiber. BridgeWave multi-Gigabit millimeter wave (80GHz) radio systems deliver fiber capacity, 256-bit AES encryption for highest data security, and the highest system gain to ensure maximum uptime and throughput at the longest distances. In addition to the Flex4G-LITE system, delivering up to 3Gbps, BridgeWave offers the Flex4G-10000, providing true fiber capacity and up to 20Gbps in a 2+0 configuration, and the entry-level Flex4G-1000, offering capacity up to 1Gbps. Blackfoot offers advanced communications solutions to customers throughout the Pacific Northwest and Mountain West regions. Based in Missoula, Montana, Blackfoot delivers voice, data, cloud and IT services to homes and businesses. For more information, visit http://www.Blackfoot.com. BridgeWave Communications provides high-capacity microwave and millimeter wave backhaul and wireless connectivity solutions to operators, carriers, service providers, governments, and private enterprises. With over 35,000 systems deployed in more than 60 countries, the company’s innovative solutions have been entrusted by customers to enable highly reliable and secure, high-capacity, gigabit connectivity while reducing operating costs relative to fiber. Founded in 1999, BridgeWave is headquartered in San Diego, California. For more information, visit https://bridgewave.com/.